I have a new winter holiday pattern for you this year: a little knitted pouch, with a flap shaped as a polar bear face! This quick knit makes a sweet tree ornament, or it can be worn as a necklace. Hide a surprise or a treasure inside to make it extra special! You need to know how to knit in the round, increase, decrease (ssk and k2tog), and make bobbles. An intermediate-level knitter should be able to knit and finish at least one of these in an evening. 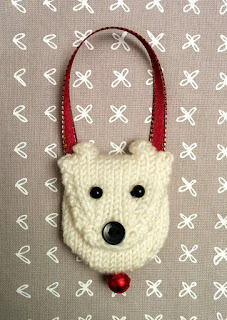 But don't be intimidated if you're more of a beginner: this project is so small, it's a great way to learn a new skill! 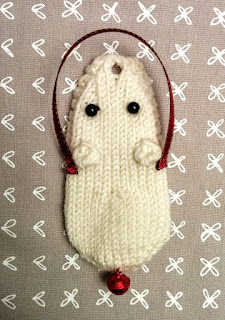 You will find the full pattern below, or download the PDF from Ravelry. 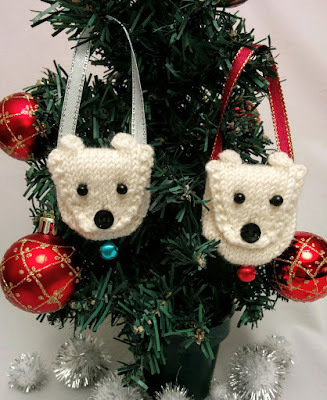 Happy holiday knitting! Needles and Notions: set of four 2.75 mm (US size 2) double pointed needles (dpns), tapestry needle, two 3 mm black beads or buttons, one 1 cm (3/8”) black button, narrow ribbon for cord (for length, see finishing instructions), thread and hand-sewing needle to attach buttons and ribbon, bell etc for embellishment (optional). 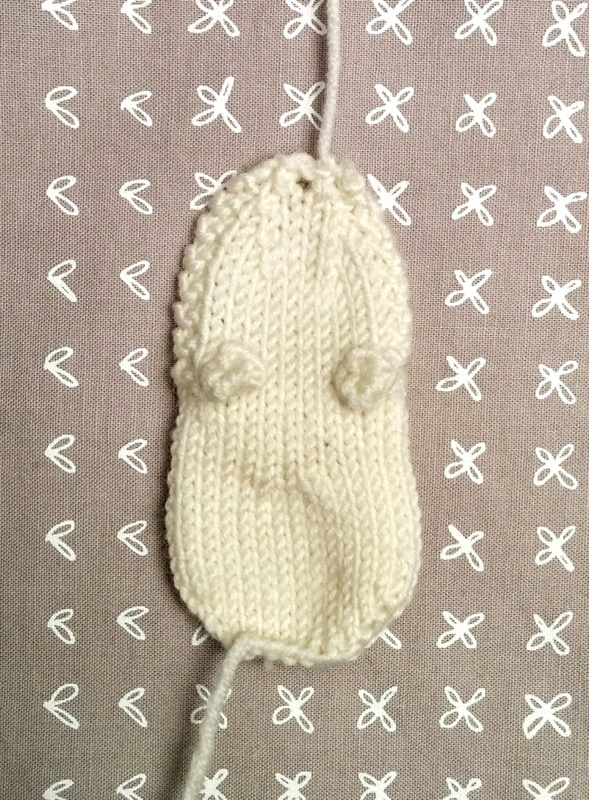 mb = make bobble (for ears): increase 5 sts into next stitch by k1, p1, k1, p1, k1 into this st. Turn, p5. Turn, ssk, k1, k2tog, then pass first 2 sts over last to have 1 st remaining. CO 16 sts. Divide stitches between 3 needles. Rnd 1: Join in the round, knit. Rnd 7-13: Knit 7 rnds. Rnd 15-19: Knit 5 rnds. Row 21 (WS): k2, p10, k2. Row 22: k3, mb, k6, mb, k3. Row 23: k2, p10, k2. Row 25-28: Repeat Rows 23-24 twice. Row 29: k2, p10, k2. Row 31: k2, p8, k2. Row 33: k2, p6, k2. Row 35: k2, p4, k2. Sew together cast-on edge of pouch. Weave in yarn ends on WS. 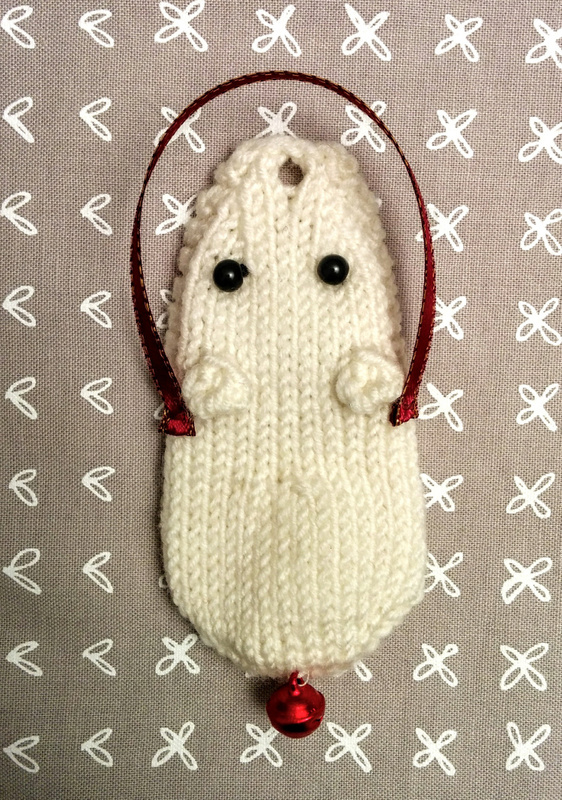 With thread and hand-sewing needle, sew smaller buttons/beads to pouch flap for eyes. Fold flap down over pouch, mark where button nose needs to be placed, then sew larger button to pouch front. 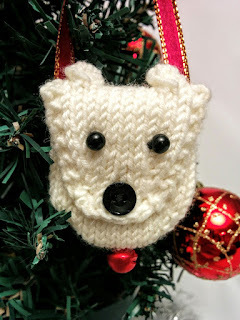 The pouch can have a short cord* (10-12 cm, 5”) for hanging as an ornament, or a long cord for wearing as a necklace (20-24”). Fold over 3 mm (1/4”) at one end of the ribbon. With thread and hand-sewing needle, sew this end, with folded edge towards pouch, just below and to outside of one ear. Repeat for other end of ribbon. 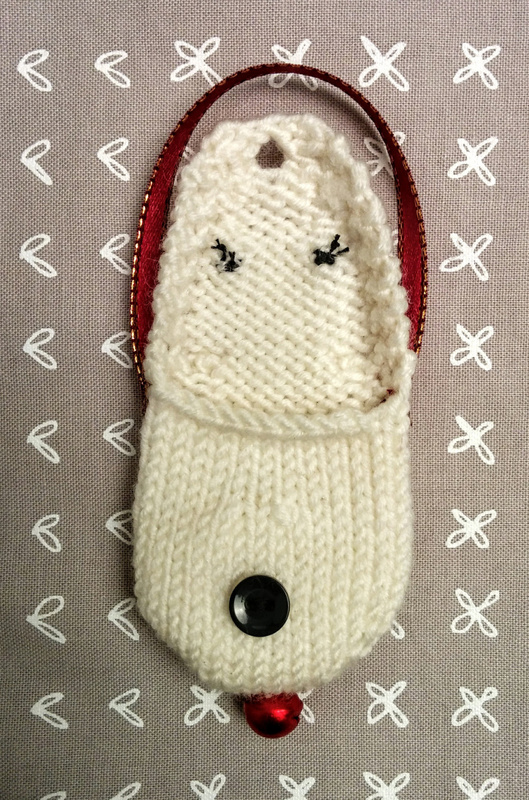 Bells or other embellishments can be added to the pouch. I’ve added a small bell to the bottom to add extra colour. You could also try a ribbon bow, fancy buttons, or just leave it simple. *If you don’t have ribbon, you could make I-cord for the pouch, but this is not shown in the pattern. With 4 mm dpns, cast on 4 sts. Work in I-cord until you reach desired length. Bind off. Sew cord ends to top corners of pouch, and weave in yarn ends on WS. Posted by Barbara Prime at 4:18 p.m.
How perfect. Taking my granddaughter on the Polar Express for her 3rd Christmas birthday. 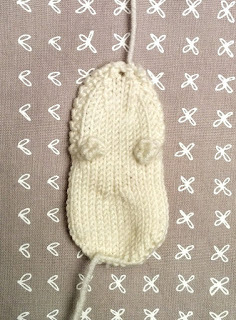 This will be the first time we get to meet her in person and the pouch will be perfect for her to put her "bell" in. Thanks so much for this perfect piece. December 2, 2016 at 12:11 p.m.
December 3, 2016 at 2:22 a.m.